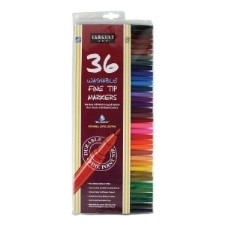 Sargent Art 36-Count Washable Bullet Tip Fine Markers in Pouch provide great illustration detail with vibrant colors. All 36 washable markers have fine bullet tips and come in a plastic, resalable, peggable pouch. Markers wash easily from most fabrics and skin with soap and water. AP Certified non-toxic.